The Ministry of Agriculture, Livestock and Fisheries  [es] of Argentina is working on a new law  to protect the intellectual property rights of companies that produce transgenic seeds. This bill, dubbed by small producers as ‘Seed Law’ or ‘Monsanto Law’, is being strongly criticized by various sectors who consider that Argentina could lose its food sovereignty if the law moves forward. [The law] wants to legalize the seeds policy that has had disastrous results in the U.S. and Europe. This law would give Monsanto the ownership of seeds. The seeds that our small farmers and landholders sow would just have to be contaminated by the gene to be considered the property of Monsanto, and seed producers would not be able to collect their seeds. Protest against Monsanto in Buenos Aires, Argentina, September 17th 2012. Photo: Maximiliano Ramos, copyright Demotix. While this happens, big media companies remain silent about the subject. The same happens with politicians, both from the ruling and opposition parties. The only one who has spoken clearly is [President] Cristina Kirchner. Of course, in favor of Monsanto. Monsanto, along with all actors in the soy chain, is finishing a consensus process that allows the establishment of a business model that recognizes and respects intellectual property rights on patented technologies, in order to be able to launch INTACTA RR2 PRO commercially in 2013 in the north of the country. 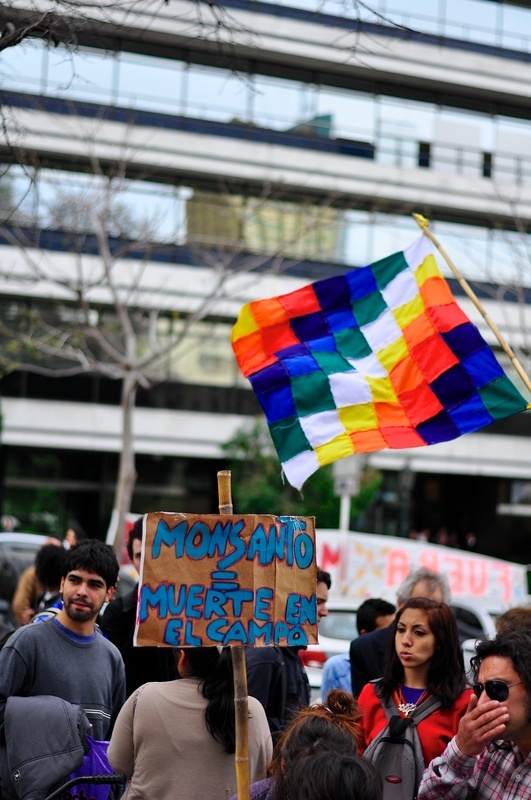 A ‘mega event’ under the slogan “Out Monsanto”  [es] was organized through Facebook for December 2, 2012. The same event had been convened on September 17. Featured image  [es] by Paola Barrios Escudero via Facebook.